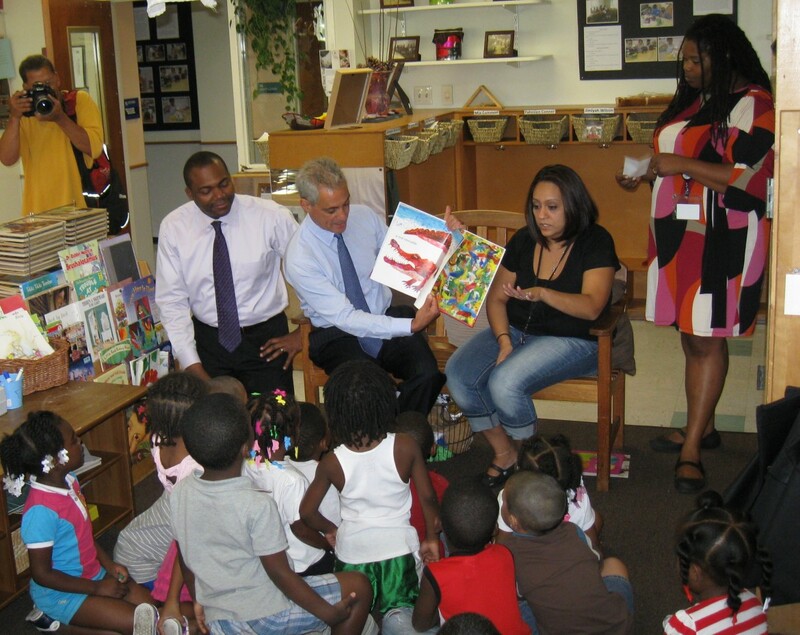 Mayor Rahm Emanuel reads to children at the Chicago Commons Nia Family Center, as schools CEO Jean-Claude Brizard looks on. Under a new system announced by Mayor Rahm Emanuel Friday, preschool programs will vie against each other in a highly competitive process to win city and CPS contracts. Emanuel unveiled the long-awaited process, and announced the city will add at least 2,000 new preschool slots next year and more in future years. Another 4,000 children will receive increased access to wraparound services through existing early childhood programs. Advocates said that they are hopeful the new system will result in better outcomes. “If, in fact, this is going to contribute to getting more kids in quality early childhood education. That is what we’re looking for,” said Rosazlia Grillier, a member of the parent organization POWER-PAC. She also said she is happy to see more funding for early childhood programs. Though the money comes from the federal or state government, the city and Chicago Public Schools administer and dole out contracts to most Head Start and state pre-kindergarten programs. Chicago Public Schools’ Community Partnership Program already allows charter schools and Catholic schools to compete for state pre-kindergarten funds, but this is the first citywide funding competition that will put different organizations with different funding streams on comparable footing. Students who attend preschool at charter schools will continue to be required to apply by lottery for kindergarten charter school seats; spots will not be reserved for them to continue attending the schools. Programs will be selected based on quality, as well as neighborhood need. Maria Whelan, executive director of Illinois Action for Children, said that the plan “has some huge, huge possible upsides” for its emphasis on serving hard-to-reach children and funding programs based on more sophisticated neighborhood-level data on access to preschool seats. However, some programs may be at risk of losing their funding altogether. New York City recently adopted a similar funding competition process for its child care programs, and families in programs that lost funding had to look for new places to send students. At the moment, Emanuel said he is not concerned about that happening. “The first thing we are going to do is make sure there is quality education throughout the city” and that parents can access it, Emanuel said. Next year alone, the effort will cost an additional $10 million – a bill that’s being footed by the city, not by CPS. Considering the city is facing a $300 million deficit, it is not clear how Emanuel plans to pay for the expansion. He stressed that parent engagement is a key factor in preschool programs’ success. “If you create a seamless web between the school and the home, there’s nothing our children can’t achieve,” he said. Create “regular, two-way and meaningful” communication between parents and teachers. Identify and target children who are most in need of services, and reach out proactively to hard-to-find families. For state pre-K programs, this can include a child’s prenatal and current health history; social development; parents’ income level, age and education level; and whether a child’s older brothers and sisters are having trouble in school. Use research-based curricula, and line up with state early childhood education standards. Collaborate with other organizations to offer families comprehensive or wrap-around services, and coordinate with any other agencies where a given family may be receiving services. Have plans for screening students for disabilities, and using assessments to improve instruction. Have set procedures for helping children transition into kindergarten, or into another program if they leave. Make detailed plans for teachers’ professional development and have a stable group of staff members, avoiding turnover that can be hard on young children. Have received two or more stars from the state’s child care Quality Rating System, or are nationally accredited. For Head Start programs, have many staff who are “exceptionally well-qualified” and hold more than the minimum credential required for their jobs. Provide a balance of different educational activities (teacher-directed and child-initiated activities; active and quiet ones; independent and guided tasks; and large-group, small-group and individual activities). This story was updated to include additional information about existing preschool programs and the charter school admissions process.